Nicol Bolas and his kin are the original Elder Dragons, the five paragons who battled for control of Dominaria in a long-forgotten age. Even if you only look at gameplay, they are the forerunners of Invasion‘s Primevals, Planar Chaos’ alternate Primevals, and Dragons of Tarkir‘s dragon-khans – and yet until M19, only Nicol Bolas had been revisited or updated. I’d say that the new cards depicting them are a welcome part of M19, and I’d say that they are well deserved and, if anything, past due. Perhaps fittingly for the most powerful and last of his kind, Bolas the Ravager is strong even if you never quite get to eight mana to flip him. A 4/4 flier is strong in its own right and wins games if unchecked, and his discard ability is not spectacular but could be the last blow in a string of the other disruptive abilities that Grixis’ cards are known for. When he does arise, though, he becomes downright terrifying. Historically, Bolas has perhaps had the most abstractly powerful planeswalker cards (as in, leaving aside mana cost), and his Arisen version continues that trend. His +2 compares very well with Jace the Mind Sculptor’s 0 and doesn’t leave you feeling like you need fetchlands or some other interaction, and I can’t help but notice that he starts on just enough loyalty to kill an Eldrazi and then reanimate it on consecutive turns. If you can alternate those with his card-drawing over two or three turns, there are a lot of strategies that will not be able to stand up against him. Talk about explosive. Nicol Bolas is getting his second creature…and fourth planeswalker. At the same time. Fancy that. The power is almost entirely in his planeswalker side, but we’ll get there! His front side is simple and straightforward: four mana for a 4/4 with flying that also forces opponents to discard a card on entry. It’s a solid creature overall that can get you there in a pinch, but it’s not too special overall. 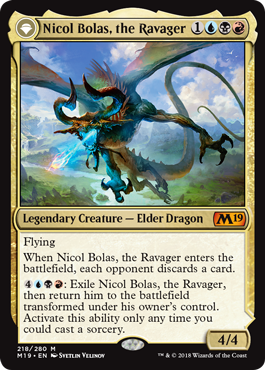 The flip trigger on Nicol Bolas is seven mana, at sorcery speed, so it’d be an eleven mana investment to get the dragon to flip immediately…but being able to space it out is a bit nicer, and the payoff for flipping Nicol Bolas is massive. 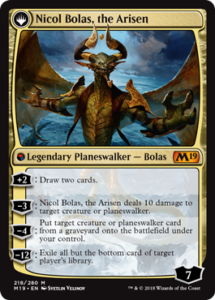 And by “massive”, I think it’s safe-ish to say Nicol Bolas, the Arisen might be the most purely powerful planeswalker ever printed. Which makes sense! It’s a heavy investment, but this also is capturing our favorite God-Pharaoh at the zenith of his power. Starting at seven loyalty, Nicol Bolas can either tick up to help you recoup cards, tick down to blast a creature or planeswalker, or tick down to reanimate a creature or a planeswalker. That makes for a clear synergy between his -3 and his -4 (reanimate the thing that you just nuked), even if it’s maybe not the flashiest way to go about things. His ultimate is suitably apocalyptic, leaving your opponent with but one turn to win before they deck themselves out. This is more flashy and grandstanding than actually suitable, but if you’re unable to break through them, the six cards you drew en route to his ult will certainly help! Nicol Bolas is undoubtedly powerful, something I feel like I’ve said before. The cost is high, but the payoff is there. I’m unsure of if he’ll work in Standard, but I’m willing to hedge my bets and presume he’ll do work.